How to create category in Docurated? : Quark Software Inc. Topics can be grouped into different categories to easily organize and find the content you need. Created categories can be viewed as separate tabs on the Topics page or listed on the Topics By Category tab (if this optional view has been enabled by an admin user). For an optional view: Open the Topic of Category tab, click the New Category button. For a regular view: Click on the Settings icon, select Edit Categories and click the New Category button. In the displayed window, enter the name of the category, add topics and description (if necessary) and click Submit. 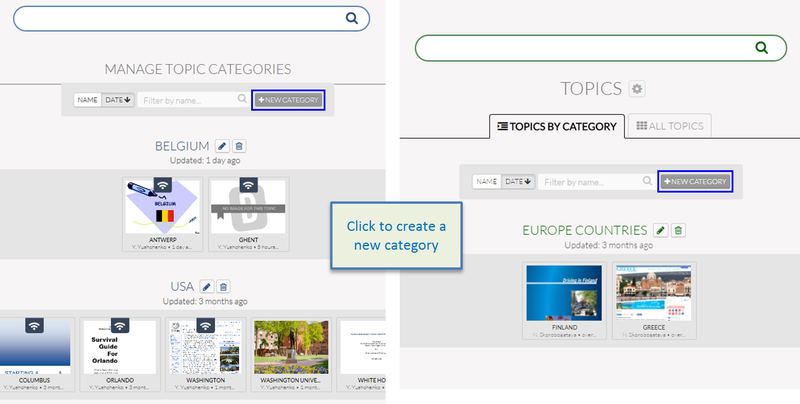 On the Topics By Category tab or on the Manage Topic Categories page, you can delete or edit the created categories, search for a specific category by name, or sort categories on the page by name or date.